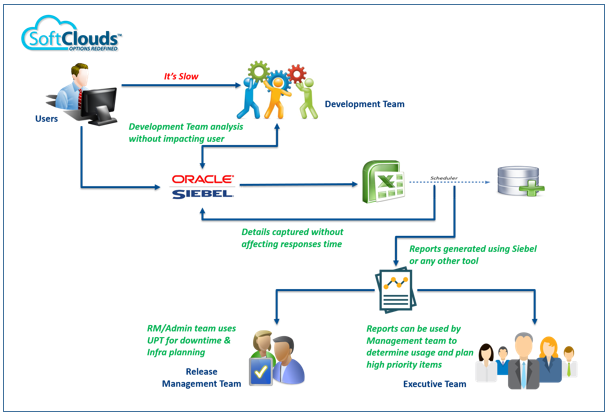 Siebel application development is a complex process and involves many business teams. As app developers, we need to understand the business process, map the process to what is available in a Siebel vanilla application (OOB), and negotiate a way forward for optimal usage of the product. This entire process spans 3–6 months or more and requires working closely with Business SMEs, Siebel Experts and Process Experts. Because of the complexity of requirements and involvement of several business teams, there will likely be communication gaps, and the final end product will often be different from what is expected. 1. How many people are using the new app? 2. What are the adoption issues, and have those issues been successfully addressed? 3. Are users adopting new features and enhancements? 4. How can we best determine the ways an upgrade or patch update is affecting end-user applications? 5. What kinds of testing should the QA or business team be doing? 6. Which areas of Siebel are heavily used, and which are never used? Are any UI improvements required to accommodate a heavily used view? Are there any remote users who aren't using Siebel? Who are the heavy users of the Siebel application? Enables the top business/management teams to identify the areas where users can be trained, and identify the scope of enhancements/fine tuning needed for optimal performance. The above figure shows how the development team and Biz team can track user sessions. User sessions are captured and are stored in CSV files which during non-peak hours can be loaded into Siebel tables using batch jobs. No user session is interrupted and no performance impact will be observed when UPT is enabled. 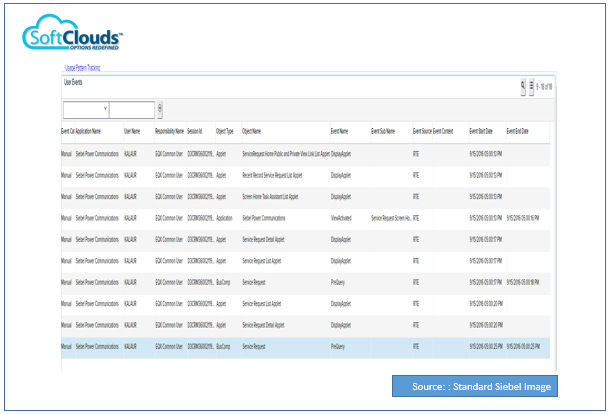 This table shows how UPT stored data can be reviewed from Siebel UI, where team members can see the logged in user and the operations he performed in different Siebel views with start and end times. From the above snapshot it is easy to analyze the views visited by the user and the amount of time spent on each view. This helps to identify areas where changes are needed, and to plan future enhancements or features. The above image illustrates a user's actions on a particular object, in this case Account List Applet, including the time taken for each operation. This information is extremely useful in targeting performance improvements. 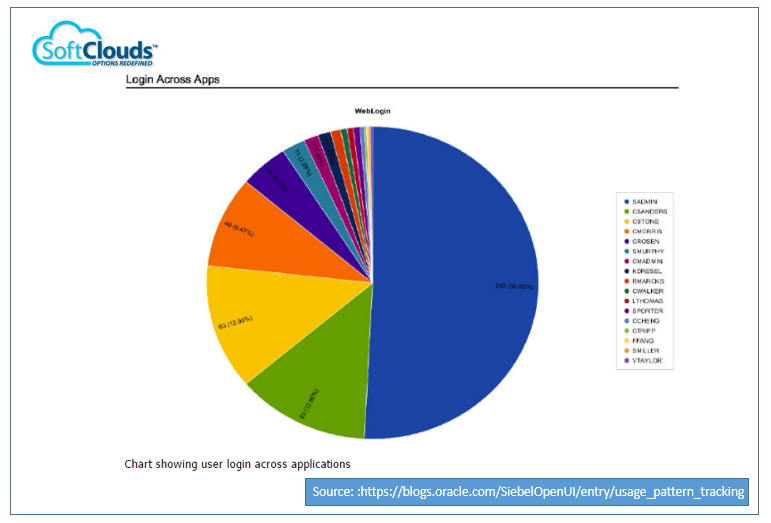 This pie chart reveals the number of times a user accessed the application in a given time frame. 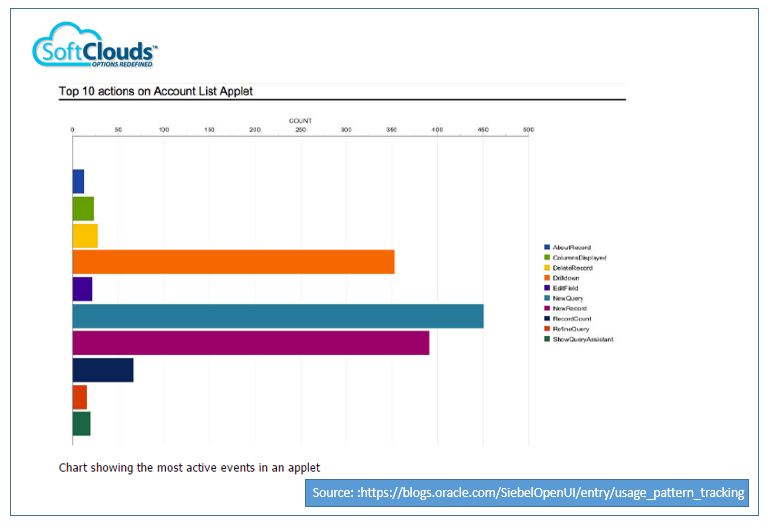 By comparing this data with usage information from other logins, it is possible to determine the frequency of usage among groups. In an ideal situation, implementation of the Siebel UPT provides a powerful tool for adding efficiency, targeting resources and fine-tuning systems. However, there may be challenges along the way. In our case, we implemented version 15.6. Subsequently, Oracle released eight patch sets and version IP2016 ( Innovation Pack 2016) which offered a wide range of new advanced features, and fixed various bugs reported in earlier versions. Immediately after our upgrade we were not able to use the application for PoC due to the limitations of the Linux OS. This was identified as a bug and brought to the attention of Oracle, which fixed the problem in the 15.8 version. If any of our readers have experienced this same kind of issue, we advise that you upgrade to IP2016 as soon as possible. A major goal of this blog is to connect with other developers and share experiences. 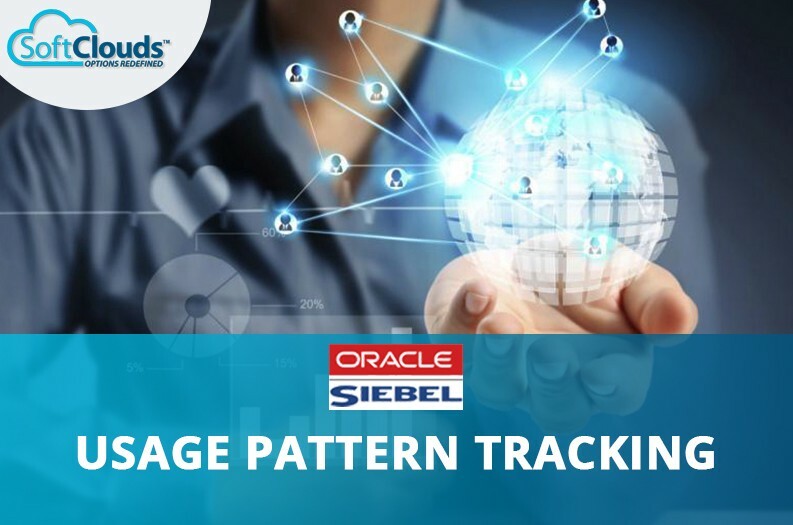 Have you benefited from this hidden treasure in Siebel OOB to overcome challenges and magnify efficiencies in your organization? What issues have you faced with the Siebel application, and how did you address them? We value your comments and your insights. If you have any questions, or would like to find out more about SoftClouds and our extensive experience in CRM, Click HERE to let us know your comments/opinions or email us at "marketing-at-softclouds-dot-com"
This post is written by Srikanth R. Keesara, a Senior Siebel Architect at SoftClouds. Srikanth has over 11 years of experience on CRM in general and Siebel in particular. He has experience working in Siebel versions 6.3, 7.5, 7.8, 8.0 and 8.1.1.14 — plus IP2014/2015 and IP2016. Srikanth has worked on multiple technologies and holds certifications in Salesforce CRM, Oracle CPQ and Oracle Commerce Cloud.